In a recent paper, Gutiérrez et al. (Nonlinear Process Geophys 15(1):109–114, 2008) introduced a new characterization of spatiotemporal error growth—the so called mean–variance logarithmic (MVL) diagram—and applied it to study ensemble prediction systems (EPS); in particular, they analyzed single-model ensembles obtained by perturbing the initial conditions. In the present work, the MVL diagram is applied to multi-model ensembles analyzing also the effect of model formulation differences. To this aim, the MVL diagram is systematically applied to the multi-model ensemble produced in the EU-funded DEMETER project. 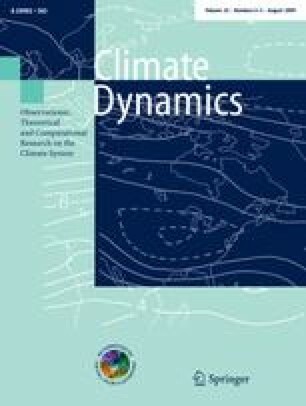 It is shown that the shared building blocks (atmospheric and ocean components) impose similar dynamics among different models and, thus, contribute to poorly sampling the model formulation uncertainty. This dynamical similarity should be taken into account, at least as a pre-screening process, before applying any objective weighting method. The authors wish to thank F.J. Doblas-Reyes for his helpful comments. The authors made extensive use of open source software for processing and plotting purposes. Namely, we used the Climate Data Operators (CDO) developed at the Max Planck Institute for Meteorology in Hamburg and the Generic Mapping Tools (GMT) developed at the University of Hawaii (Wessel and Smith 1991). This work was partially supported by the Spanish Ministry of Education and Science through grants CGL-2007-64387/CLI and CGL2005-06966-C07-02/CLI. J. F. is supported by the Spanish Ministry of Education and Science through the Juan de la Cierva program.